We fundamentally disagree with the President that the Cohabitation between the LDS majority in the National Assembly and the Executive Government of Parti Lepep (PL) is working. We have to take several factors, which includes the economy/ costs of living into consideration in order to arrive at a satisfactory conclusion on whether the Cohabitation is working or not. It is clear that the collaboration between the LDS majority in the National Assembly and the Parti Lepep Executive is proving unsuccessful when it comes to bringing down the inflated costs of living; a situation that is now unbearable for a large segment of the population. The will of the people by all intent and purposes was for Parti Lepep to govern and for the LDS majority to provide (genuine) checks and balances. This unfortunately is not happening in any real sense. However, The Cohabitation has been very successful in one thing and that is making deals behind closed doors in total contravention to transparency and the will of the people. The President has successfully appeased the leadership of LDS and the Leader of the Opposition (LOTO) in particular; by appointing many of his supporters in key positions in Government and at National Board level. And, also in dishing out favours and privileges to the top echelon of the parties (PL & LDS). The way that this Cohabitation has been developing over the ten months that it has been in existence is not in the best interests of ‘people and country’. An example of that was late last year; the LDS majority in the National Assembly and the PL representatives conspired to shelve the 13th month salary for the private sector workers. It was finally brought before the National Assembly for debate and approval through pressure applied on them by this newspaper. In contrast, the first thing they did was to feather their own nests by enacting legislation to provide National Assembly Members, Ministers and Constitutional Appointees with early pension. On Tuesday the President said: “Mr. Speaker, one of my main preoccupations has been how to cope with a population that is increasingly living longer. In 2016, for the first time in our history, our women are living on average to an age of 80 years. Men are living to an average age of almost 70 years. In view of these statistics, we cannot think of sustainability without thinking of our responsibility. We - who are still working, And what will be the responsibility of the young generation that will have the responsibility in the future to take care of us. This leads me to the subject of pensions. As you all know the pension that all our citizens receive upon retirement at the age of 63 comes from the National budget. And the sum is SCR5, 050 per month. And all citizens who have contributed to the pension fund can enjoy their pension from the age of 60, in line with their contribution. If, the Cohabitation is working, it is only working for them not for (us) the ordinary men and women in Seychelles! 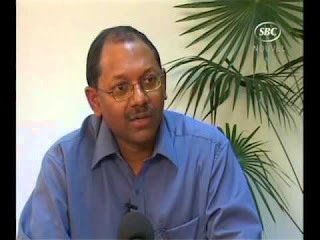 DANIEL CESAR SUSPENDED - PAT PILLAY TAKES REFUGE!